Client: Social Bikes, a non-profit local bike-sharing operation out of New York needed custom bike racks in 105 stations throughout the Hamilton-Ontario area for their bike-share bikes. Industrial designer Michael Steiner looked for a local manufacturing company to design and produce the racks, but was unable to find one that was communicative, offered competitive prices, and had the right tools. Frustrated, but determined to find the perfect manufacturing partner, Michael performed an online search and found Madrax in the results. After an initial call with the Madrax team, Michael decided to work with Madrax - even though they are located halfway across the country - as he was impressed with their responsiveness, prices, and production capacity. Challenge: Few companies other than Madrax were willing to partner with Michael on such a unique rack and work around the design and financial limitations of the project. The bike-share stations were planned throughout the city, and not only did the project have a pre-determined budget, but the custom bike racks - comprising the stations - had to meet certain city requirements. Michael depended on Madrax to help him design bike racks to the exact specifications of the city, the needs of the bikes, and that were priced within budget. Solution: Willing to extend the project timeline in order to create a successful bike rack design within budget, Madrax used their standard U rack with bar as the basis of their design and took the time needed to develop it with Michael to meet his exact requirements. A month of conceptual development had Michael communicating with Madrax daily, and culminated in a flight to the Madrax plant in Waunakee, WI to further define the rack design. While for the most part the partnership between Social Bikes and Madrax was cross-country, communication flowed smoothly thanks to online file sharing. Initially, Madrax completed four different designs and worked with Michael to choose one to fine-tune. While Michael was visiting the plant, they finalized the design, and the shop made a prototype for Michael to review during his two-day stay. Another prototype was later shipped to Michael where he and his team tested the rack with its base plate. When the testing revealed that the bike sat at an odd angle and the lock didn't work properly, the Madrax and Social Bike team decided to work with the original prototype. 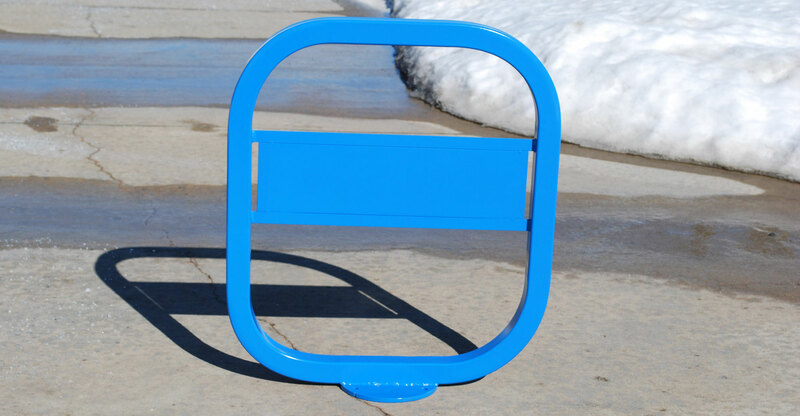 The finalized racks for Social Bike include branding plates that doubled as lean bars in the middle of the rack, square tubing for security and a height and width to match the locking mechanism on the bikes. Additionally, the racks allow bike pedals to fit comfortably beneath the branding plate, and match current city furniture with an automotive-grade finish consisting of an epoxy primer and custom gunmetal gray powder coat finish. Still a work in progress, Madrax has secured signatures and approvals for the Social Bike rack design and manufacturing is underway. Social Bikes struggled to meet project requirements, and as a result, Michael contacted Madrax often with special requests and changes. Madrax was quick to respond to alterations and was realistic as to how changes would affect the project timeline. Many other fabrication companies were not able to handle such a large order (approximately 1,500 racks), but Madrax jumped at the opportunity and set an ambitious, yet practical, timeline to complete the project. From the beginning, Michael felt that Madrax was invested in the Social Bike custom bike rack project. Going so far as to request that a bike be shipped to the plant in Waunakee from New York to make sure a prototype worked, Madrax was upfront about what they needed from Michael to create a successful design. Out of all of the other manufacturing companies that Michael researched, he felt that by far, Madrax seemed the most invested, and if he called "17 times in 20 minutes," as his needs changed, it was no problem. Results: While the order for Social Bikes is not yet complete, Michael is confident about the success of the project, and says that Madrax has been the "least stressful part" of the entire process. Offering over 750 bikes, the Hamilton-Ontario Social Bike share in New York City will utilize these custom racks in 105 hub stations around the city of Hamilton. Commuters and recreational bikers alike will be able to rent a Social Bike, cycle within the city at their leisure, and securely park their bike at a custom Madrax bike rack when they reach their destination.